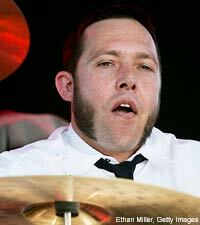 According to Fullerton, Calif. punk rock outfit Lit's MySpace page, the band's drummer, Allen Shellenberger, has died. Surrounded by his family, close friends and bandmates, Shellenberger, who was 39, lost his heroic battle with brain cancer on Aug. 13. Shellenberger was first diagnosed with a malignant glioma brain tumor back in the spring of 2008 and immediately underwent clinical trials, chemotherapy and radiation treatments at the Cedars-Sinai Maxine Dunitz Neurosurgical Institute in Los Angeles. "To know Al was to know laughter," the band said in a statement. "He had a heart of gold and would do anything for anyone. Words cannot begin to express how much he will be missed. This was our brother and not a day will go by that we won't think about him. Right now we're trying to find the balance of mourning his loss and celebrating his life. Allen has experienced more in his 39 years than most people dream of in ten lifetimes. This is a tremendous loss for us, our fans, and also for Allen's family who took such good care of him during his battle with cancer." Allen is survived by his daughter, Giovanna Mackey, his mother Connie James, and his father, Paul Shellenberger. Funeral services will be private for family members only, and a memorial event is being planned for a future date. Of course, Lit first rose to fame during the 1990s, with a string of rock radio-embraced hits like 'My Own Worst Enemy,' 'Miserable,' 'Addicted' and 'Times Like This.' In 1999, the band joined RCA's roster, releasing 'A Place in the Sun.' During the course of the their career, they've played high profile gigs, including a Warped Tour run, the 1999 rendition of Woodstock and jaunts with the likes of the Offspring, Garbage and No Doubt. The band parted ways with RCA in 2002, and released several independent LPs, including 2004's eponymous album, which peaked at #113 on the Billboard Top 200 and #6 on the Top Independent Albums chart. Soon after Shellenberger was diagnosed, the band organized a benefit for Allen at House Of Blues in Anaheim, Calif., which featured performances from Sugar Ray and Handsome Devil. No Doubt drummer Adrian Young filled in for Shellenberger on the drums for a few songs during Lit's set.